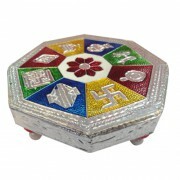 Chowki / Seat-Ashatdal Nav Shubhankar (Meenakari)Dimension: 4 x 4 Inches Approx.It is rec.. It is recommended that the divine figure or a symbol should be placed on a proper aasan ( seat or platform ) and It is obvious also that any figure or a symbol we adore most, we want to keep or place it with full reverence. ASHATDAL NAV SHUBHANKAR CHOWKI/SEAT, on which these Charismatic Charan Paduka are placed is the symbolic representation of ashatdal padma (eight-petal-lotus) which is considered to be the foundation of Hindu Philosophy. It is intrinsically related to Mahalaxmi , it is believed to bring not only the wealth but wellness also. In addition, it takes care of not only Nav-Grah -Doshas but also of Drishti- Dosha ( Evil- Eye). This apart, it is considered very auspicious to place God / Goddesses statues, Pooja Thali, Kalash etc. Its significance and importance is well elaborated in scriptures. Rangoli is nothing but the broader form of this ashatdal padma. In Budhism this represents the eight fold path of noble life. In the world of yoga this is represented by the Padma aasan. Almost all Gods / Goddesses carry the padma(lotus) to bless their devotees. This kind of devotional masterpiece is rare in Meenakari craftsmanship.